When I learned to make screencaps, I knew I would one day make caps of this EE sequence, since I have always wanted more shots from this scene than were available on websites. Now I have them. Perhaps some of you have been wanting them, too. They're absolutely beautiful, every single one of them! I think it's high time I watched the movies again - it's been far too long. Thank you for bringing this fact to my attention! Hi, Maewyn! I watched the films twice in the last two months, although I skipped through them quite a lot the second time around because I was running out of days to watch them while at my mother's (she's got one of those big, flat screen TV's; lovely!). Pardon me for butting in, but(t) :-D I have a relevant question regarding flat-screen TV's. We recently bought one and we are very pleased with the visuals - but - we are having trouble with the lip-sync. The sound comes before the lips move and it's very irritating. Did you have this problem? Do you know why this happens? Do you know if anything be done about it? Sorry to trouble you with this. Now that you mention it, Este, I did notice some bad moments of sync, but put it down to ADR not matching up with the final print, and my never noticing it before because I'd been watching the film on smaller, blurrier screens. It was not consistent, which made me think it was something I'd simply never noticed before. But maybe it is something about the translation electronically to a flat-screen picture. I can't imagine why it would make a difference, but I'm no technician, lol. Thank you Mechling (((Cyber hugs))). I'll do some investigating and let you know what I discover. The information might be of help to others. Thank you, White Gull. Although I've physically been back for over a week, I didn't really *feel* back until I had posted about LotR. There. Now I feel better! Why, thank you, Goldie/Magpie. Yes, it's a complete little jewel of a scene. ahhhhggh! I DID miss this! Thanks for pointing it out. I would have died. I absolutely love this scene and always almost go blind when it is on the screen for lack of blinking. 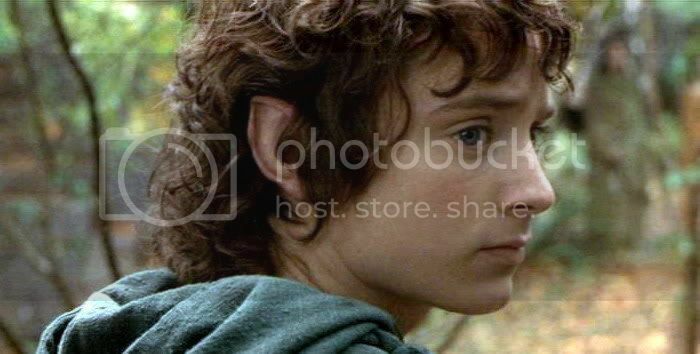 I still haven't seen what everybody else is doing whenever Frodo is onscreen as many times as I have watched that movie. Did they do anything important? He is so gorgeous in this. His hair is perfect and you can see his ears making him look so mythological. But it is that delicate man boy face that really makes me sigh. That kid better never come near me looking like that. Thank you for doing these!!!!! I already have sketched a couple of these frames before because it was such a favorite of mine but now I have much more. Thanks again! I already have sketched a couple of these frames before because it was such a favorite of mine but now I have much more. Ooooooh! If you do sketches please let me see them, Taerie. He's exquisite in these. And, yes, there are several lovely ones that showcase his beautiful ears.